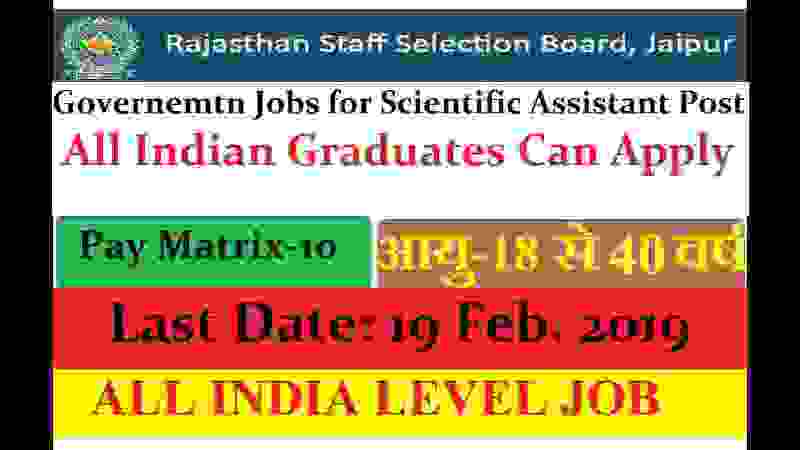 Service Selection Board of Rajasthan State is looking to recruit fresher Indian candidates for Scientific Assistant Posts. There are total 28 vacant positions which are going to be filled up through this RSMSSB recruitment 2019 procedure. If you want to check out the official notification you can visit to the official website of RSMSSB website in which they shared the PDF file in HINDI language related to this RSMSSB Recruitment 2019.We also get the information from that PDF file and share with you readers in this Job posting. If you don’t want to read the whole PDF file in HINID language you can check out this whole article carefully for full information related to these Government jobs in Rajasthan state. Read the whole job posting carefully before applying online. 1). Job Profile Name: Jr. Assistant. Pay Band: Level Matrix–10 Per Month. Educational Criteria: All those Indian candidates are eligible to apply who have passed in their Graduation under BSc Stream only. Age Criteria: Age of the applicants must in between 18 years to 40 years. Those who fall in between this age limit can apply for these Government Jobs in Rajasthan state. Paying Method: You have to pay the application fee only through online methods:” Credit Cards/Debit Cards/Net-banking” for the payment of the above application fee. Apply online for these Government jobs in Rajasthan State. There is no off line method for applying this recruitment process 2019. We share the direct link under IMPORTANT LINK section related to this recruitment process. The process for applying online through the official website will remain activated up to 19th Feb. 2019. You can start applying online for these Govt jobs from 20th Jan. 2019. 19th Feb. 2019 is the Last Date to apply.